Embattled Minister of Aviation, Stella Oduah, and her associates have spent the last several hours scrambling to clean up the minister’s biographies on the Internet, following allegations that she lied about her academic qualifications, PREMIUM TIMES can report today. News website, SaharaReporters, had Monday quoted authorities at St. Paul’s College, where Mrs. Oduah claimed she studied for Bachelor and Masters degrees, as saying they did not award her an MBA at anytime as the university does not even have a graduate school or graduate programme. The minister is yet to respond to the allegations. Efforts by PREMIUM TIMES to get her to comment for this story were unsuccessful. Joe Obi, her special assistant on media, did not answer or return calls. Yakubu Datti, the spokesperson of the aviation agencies, who usually speak for her, said he was not aware of the allegation against the minister, and that he would revert after consulting the minister. He is yet to do so as at the time of publishing this. However, this newspaper has observed an attempt by the minister and her aides to revise her profiles on the web with a view to cleaning up any reference to St. Paul’s College in her history. 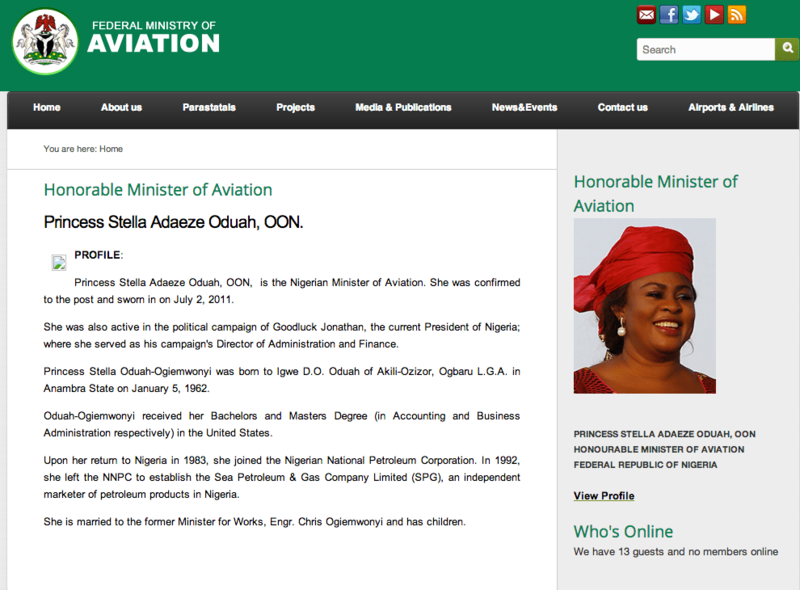 Already, Mrs. Oduah’s biography on the website of the Ministry of Aviation has been revised, with references to St. Paul’s College now wiped out. “Oduah-Ogiemwonyi received her Bachelors and Masters Degree (in Accounting and Business Administration respectively) in the United States,” the new profile said of Mrs. Oduah’s education, without any reference to the university she attended. 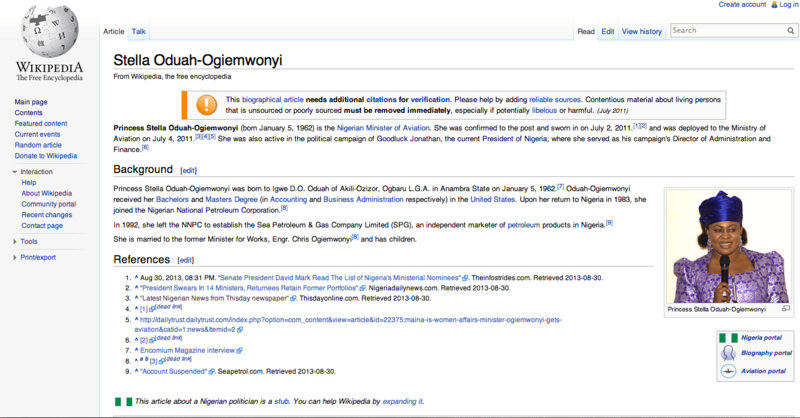 The Wikipedia page of the minister was also edited and it now has no reference to the university Mrs. Oduah attended. The last edit on the Wikipedia page was done at 14:41 p.m. Nigerian time. All links and reference materials on the Wikipedia page capable of linking the minister to the university that has disowned her have also been deleted. Even the minister’s personal website has been reviewed to remove any reference to St. Paul’s College. While the links leading to Mrs. Oduah’s foundation and photographs remain active, the other principal link, which should lead to her history page, has been deactivated. It’s unclear whether it was being edited at the backend when PREMIUM TIMES visited the site. Mrs. Oduah had in a resume she presented to the Senate as a ministerial nominee in 2011 indicated that she obtained a Master’s degree in Business Administration (MBA) from St. Paul’s College Lawrenceville, Virginia, United States. But SaharaReporters quoted the President of the college as saying his university had never in its 125-year history had a graduate school or graduate program. The school’s website also indicates clearly that Saint Paul’s College awards only baccalaureate [bachelor’s] degrees. It is not clear yet whether the minister received an undergraduate degree from the college as she claimed. SaharaReporters said Dr. Claud Flythe, the college’s current president was unable to confirm that claim because the college had been closed since June 2013 after it lost accreditation. Mrs. Oduah had since October being enmeshed in a a N255million armoured cars scandal in which she was accused of compelling an agency under her supervision, the Nigeria Civil Aviation Authority, NCAA, to buy her two exotic bullet cars at clearly inflated prices. The purchase of the cars generated outrage for weeks because its cost was inflated, and it was neither listed in the government-approved budget nor did it comply with the Nigeria’s public procurement law. The House of Representatives has since asked President Goodluck Jonathan to sack the minister but the president has failed to act. UPDATE 1: Minister Oduah has intensified her cover-up schemes. After our initial report at 2:09 p.m. Nigerian time, the minister has returned to revise her Wikipedia page multiple times. The latest revision was done at 4:21 p.m. Nigerian time. A link to an interview she granted Encomium Magazine now leads to a 404 error on that website. UPDATE 2: An apparently troubled Minister Oduah has however not remembered to revise her official Facebook page. It still has St. Paul’s as the college she attended. It appears her handler only remembered to edit her profile page only removing all traces of St. Paul’s College from the account. See below screenshots of her unedited Facebook page and her Facebook profile (after the revision).